Description: In this product, the fruit is caught into cubes. Content: 70% quince and 30% natural apple juice. 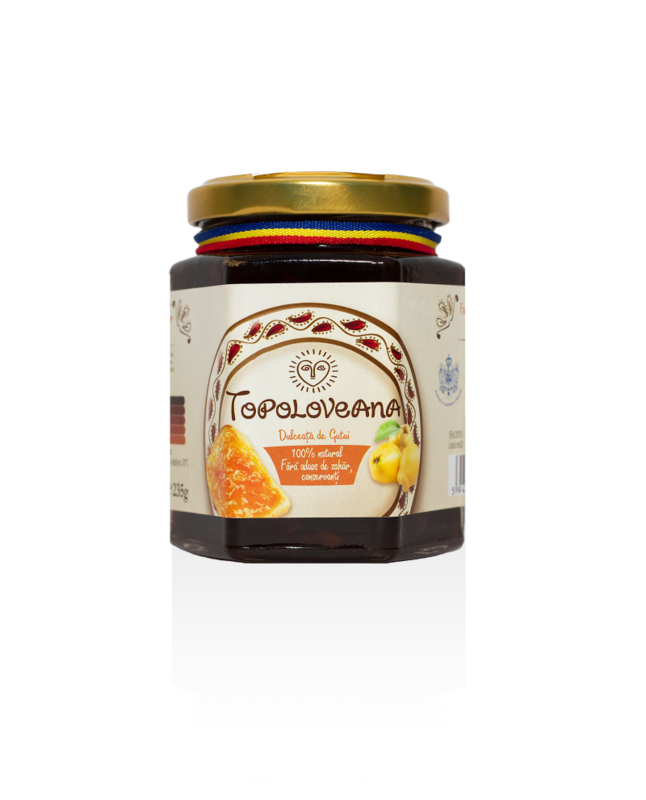 Topoloveni Quince Gourmet Confiture–235 g.
Nutritional qualities: The Quince Gourmet Confiture has medium energetic value (255 kcal/100 g) and content of foodfibers of 8,5%. It is all natural, sugar free, preservatives free, additives free. Does NOT contain sugar or other industrials sweeteners. The production technology is the bain-marie system (indirect heat). The fruits are boiled in double walled kettles at a temperature of 68-70 degrees Celsius, using technological steam in order to preserve the vitamins, minerals and phytonutrients. The sugar syrup, usualy used in the production process, for the regular fruit preserves, has been replaced with natural apple juice. Awards: The product received the “Quality Brand” (from National Centre for Comparative Tests) and the title of Official Supplier of the Romanian Royal House. Benefits: The quince fruit contains magnesium, phosphorus, iron, copper, sulphur, vitamin C, vitamin pp, vitamin B, vitamin A, calcium, carbohydrates, tannin, lipids, malic acid.